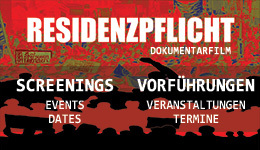 Berlin/Jena: RBB Documentation | PEACE Int. Symposium | African Youth Solidarity to Break Deportation. Berlin / Jena: RBB Documentation | PEACE Int. Symposium | African Youth Solidarity to Break Deportation. Read more about Berlin/Jena: RBB Documentation | PEACE Int. 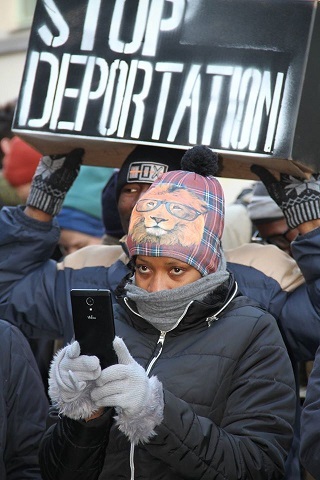 Symposium | African Youth Solidarity to Break Deportation. Critics on crisis of racism in Europe: Refugee-Migrants struggle is the solution. Most protests of the non-refugees and supporters' struggles are often polarized to dominate and to neglect the autonomous struggles of the refugees political communities. Even demonstrations and Conferences continue to ignore the refugee community agenda for autonomy and liberation. We are resolute that the community agenda for autonomy and liberation is the Challenge of our Time! Taking our struggles beyond political socialization of the oppressed community is a task ahead of us. 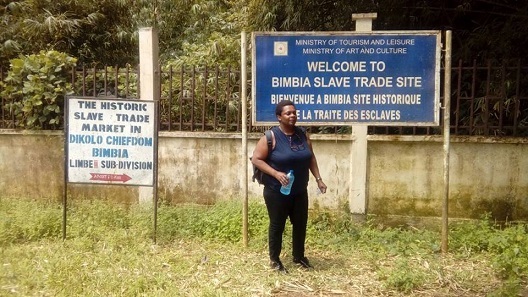 Listen to/ Hört THE VOICES with Mbolo Yufanyi and Co.
Sierra Leone United Association in Germany demands deportation stops and abolition of the Dublin System: “Freedom of movement for all!" If you missed the last show, click here to listen. BERLIN: A 28-year-old Pakistani asylum seeker has committed suicide by jumping from the rooftop of a hotel building in Leipzig city, Saxony. On the afternoon of March 30, Faisal Imran was seen standing on the roof of the Seaside Park Hotel's building. Police and rescue teams were called immediately. 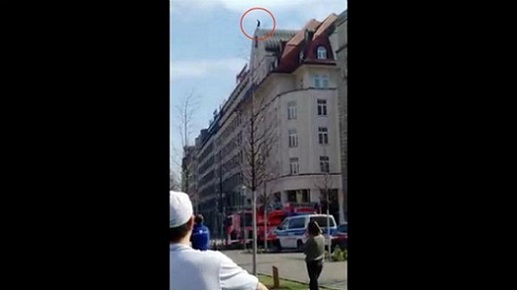 At 14:15PM he threw himself off the roof, which was filmed by unknown eyewitness from their mobile phone. The video of the tragic incident has become viral on many social media sites. 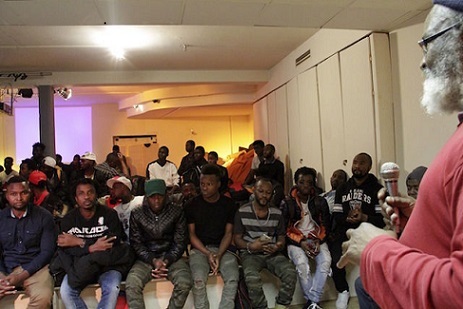 Video Clips on The Caravan "Experience" Refugee Struggles' Empowerment Network of self organized activists and groups in Germany. Please make donation: Engage and work with us for an independent refugee community and Join to make donation to support our mobilization events for 2017 grass root struggles of the refugees communities on our movement to make “The Refugee Black Box " a concrete political solidarity weapon. This event is entirely financed by private donation and solidarity contribution only. Timo Kiesel: You are CEO of PEACE (Peer Exchange of African Communities for Empowerment). What does PEACE do? Read more about Break the Deportation DNA Chain: "Refugee Black Box – The irrepressible voice and power of the afflicted" - Beyond the Court rooms! We shall never waver, we shall keep the voice loud until justice is served truthfully, rightfully and fairly to all. Oury Jalloh Campaign: "When Exposing a Crime is treated as committing a Crime, You Are Ruled By Criminals." On the 7th of January 2005, 2 African brothers Oury Jalloh and Layé Alama Kondé, were murdered by German Police in Dessau and Bremen (Germany) respectively. The murder of Oury Jalloh is not singular nor is the perpetrator of the crime individual. It was a collective, systemic and systematically State-organized crime that still goes unabated. Read more about Oury Jalloh Campaign: "When Exposing a Crime is treated as committing a Crime, You Are Ruled By Criminals." Read more about Multilingual: ROMA BLACK BOX - Break deportation Solidarity: Arabisch, English, Deutsch, Türkisch, Serbisch, Französisch, Mazedonisch, Farsi. Frankfurt Flughafen: Abschiebungen stoppen! Bleiberecht für alle! // Stop Deportations! Right to Stay for everybody! Read more about Frankfurt Flughafen: Abschiebungen stoppen! Bleiberecht für alle! // Stop Deportations! Right to Stay for everybody! Refugee activists will speak on their experiences and struggles with deportation and social exclusion in Thüringen and Germany. After that their will be live music and other cultural programm.